Join this 3.5 hour art-filled experience and satisfy your artistic curiosity! Matsuoka Museum of Art, located in Tokyo's Shirokanedai area, houses a broad range of valuable artworks and artifacts. During this tour, not only do you get to marvel at the sheer beauty of the exhibited pieces, you'll delve deeper into the backstories and secrets behind them. Enjoy browsing the stunning collection of sculptures, paintings, and ceramics from around the world and different periods of time with in-depth commentary from an expert guide, and later engage in a lively conversation with him while having a lunch at a cafe. Make your way to Matsuoka Museum of Art, located in the quiet residential area of Shirokanedai, Tokyo, and meet your guide, who is a big art lover himself and has made more than 5000 visits to museums across Japan over the past four decades. Before going inside the museum, first head over to a nearby cafe. The guide will fill you in on what to see in the museum over a cup of coffee, as knowing beforehand the backgrounds of the artists and their works makes for a far more enjoyable art-viewing experience. While there, ask him any questions and he will gladly answer all of them. And now, time to go inside and browse around the museum for about 75 min. 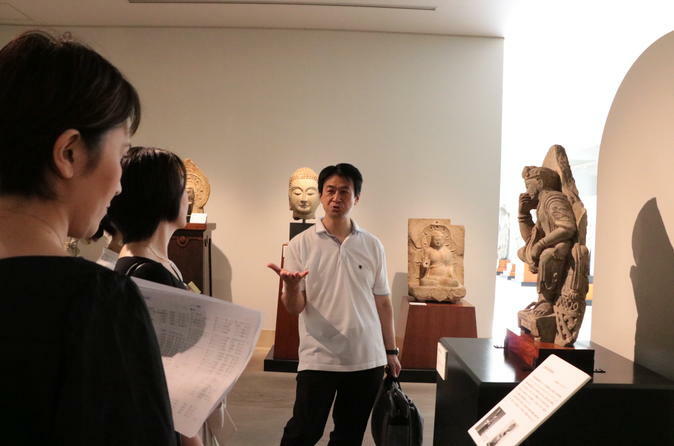 Take your time and enjoy the eclectic collection of valuable artworks and artifacts, ranging from ancient Gandharan sculptures to Victorian paintings to Asian ceramic art. Each piece has its own back stories, so lend your ears to the guide's commentary about artists' creative intentions, clients' wishes, as well as the historical and social context behind them. You can also take pictures of most of the exhibited items with the flash off. After you've fully appreciated the lovely artworks, join the guide for a fun lunch at a cafe to exchange thoughts and impressions on the pieces you saw before ending the tour.